When you choose to remodel your bathroom there are many important factors that need to be taken into consideration. 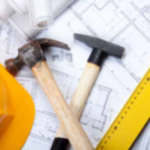 Our bathroom remodeling guides will help you transform your bathroom every step of the way. These guides include vanity products and installation tips as well as water closets, specialty cabinets, flooring, tubs and more! There are many beautiful flooring options for homes, but which are best for a room that produces a lot of moisture? 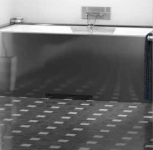 Download this guide to find out what flooring materials might be ideal for a DIY bathroom installation. 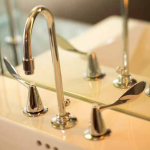 Function can be just as important as appearance when choosing your bathroom vanity, shower, and tub faucets. 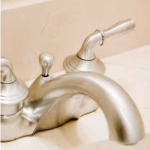 Download this guide to discover which faucets might best suit your family's lifestyle. Whether you're looking for a little pizzazz or are concerned about safety, there are a lot of options when choosing bathroom hardware. Download this hardware guide to find out what's available to complement your decor and keep your family safe. Is your existing bathroom short on storage space? Download this guide to find out about the many specialty bathroom cabinets manufacturers offer. Is relaxing in a luxurious spa your idea of the perfect way to end a day? 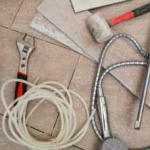 Download this guide to find out what's available and what should be considered when using spas in a bathroom remodeling project. Vanity cabinets are available in countless styles, finishes, and configurations -- there are even models that allow you to save a little on your project by assembling the boxes yourself. Download this guide to discover what's offered and which might work best for your budget and project. 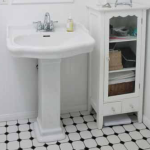 Installing vanity cabinets can be a little more involved than just setting them in place. Download this guide for step-by-step instructions that walk you through the installation process and show which dimensions can be critical. Are all vanity tops DIY-friendly? Download this guide to learn more about how they're installed and some of the top options for a DIY project. The most difficult part of a bathroom remodel might be choosing which of the many vanity top options might be right for your family and decor. Download this guide to learn more about the numerous materials such as cultured marble, granite, and recycled glass that have become bathroom designer favorites. If you thought all toilets were the same, get ready for a big surprise. Download this guide to discover what styles, tank systems, and even heights are available for your project.